"Sazo Idemitsu" is a man who has put everything only for oil sales for more than 50 years since establishing Idemitsu Shokai at the age of 25. At some times battling with major foreign oil companies, and at other times with the government, military authorities, and even GHQ, he championed "large regional retail business" which could enable smooth delivery of oil products between producers and consumers. Setting the "big family principle" as the foundation, he spent his life growing Idemitsu Kosan into a major nationally produced oil company with his ever-present fantastic and unique ideas. 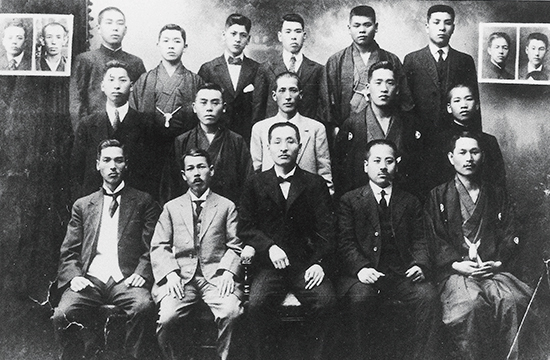 Sazo Idemitsu was born in 1885 in Akama Village, Munakata District, Fukuoka Prefecture, a child of Fujiroku Idemitsu who ran an indigo wholesale store. At the time Munakata City was thriving as an inn town, and Idemitsu's parents’ home was known as a particularly wealthy. Raised in such a promising environment, Sazo is said to have been very perceptive and stubborn--the type who wouldn't stop until he got his way. After graduating high school, Idemitsu joined Sakai Shoten which dealt in wheat flour and machine oil in Kobe. The owner had just recently established his company independently after leaving Mitsui Bussan, as would be called as a venture company in modern terms. Many of his school friends asked him why he would work for such a small company, but having his own burning desire to become independent in the future, Idemitsu thought that he could learn the job better at a small company where he would have to do everything by himself. After he had gotten quite experienced at his job at Sakai Shoten, in 1911 a turning point came to Idemitsu. Through his work as a private tutor for the son of wealthy investor Jutaro Hida, Idemitsu received from Hida a proposal saying, "I would like to give you 6,000 yen from the money I got selling my holiday home as a start-up investment”. 6,000 yen at that time would translate into about 80 or 90 million modern yen. However, there was a somewhat odd condition to this loan. Hida told him: "You do not need to return the money, pay interest, or even report on your business. You may use it as you wish. However, you must achieve your initial intention of starting up your business. Please get along with and work with your employees like they are your family." 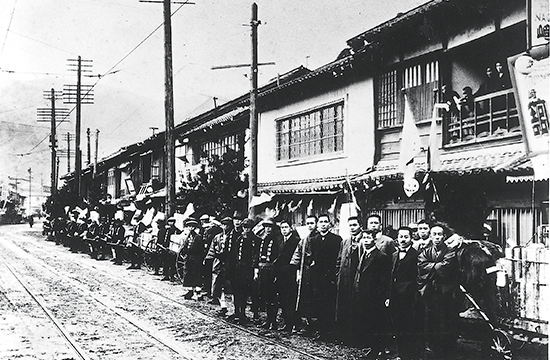 Accepting these conditions, in 1911 Idemitsu took the first steps toward oil retail business as Idemitsu Shokai (the predecessor to Idemitsu Kosan) in the Kita-Kyushu trade port of Moji. Soon after establishing Idemitsu Shokai, he concluded contracts with Nihon Sekiyu as a special agent, starting by selling machine oil using his experience from his Sakai Shoten days. The sale of fishing boat fuel also got on track, and the administration foundation saw a tentative stability. As of 2018 the company has the number 2 domestic market share as a nationally produced oil company. Never having undergone a merger or acquisition and never having collaborated with foreign oil companies, it would not be an exaggeration to say that Idemitsu Kosan is actually the number one nationally produced oil company.